I’m a few days late on the district court decision (news reports here, here, and here) by Judge Denny Chin of the U.S. District Court for the Southern District of New York dismissing in part the lawsuit filed by Robert Burck (a/k/a “The Naked Cowboy”) against Mars Incorporated, the maker of M&Ms candies, over an M&M ad featuring a cartoon M&M guitar-playing street performer wearing a cowboy hat, boots, and underwear – all reminiscent of Burck’s alter ego. See Burck v. Mars, Incorporated et al, Case No. 08 Civ. 01330 (S.D.N.Y. June 23, 2008); see also my previous posting on the filing of Burck’s complaint here. Here, there was no attempt to create a portrait or picture of Burck himself. Rather, the purportedly infringing images were M&M characters wearing Burck's signature outfit. The images were not portraits or pictures of Burck as The Naked Cowboy, but of M&Ms dressed as The Naked Cowboy. Thus, they do not violate sections 50 and 51, and accordingly, Burck's right of privacy claim is dismissed. 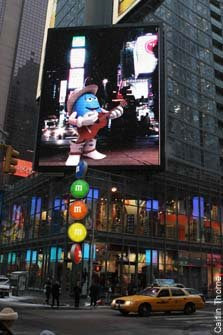 However, the judge denied Mars’ motion to dismiss Burck’s “false endorsement” claim under Section 43(a) of the Lanham Act because consumers may mistakenly believe that The Naked Cowboy himself endorsed the copying of his "trademarked likeness" because the M&M Cowboy characters appear in a commercial setting (i.e., on the video billboard and inside the M&M World store). The court added that the issue of whether M&M’s ads would be viewed as parodies, and thereby negating any likelihood of confusion or constitute a First Amendment fair use affirmative defense, raises factual questions that are inappropriate for deciding on a motion to dismiss. This case will settle, in all probability. It is hard to understand, however, how any rational fact finder could consider this use of the “concept” of the Naked Cowboy, and what he does, to cause likelihood of confusion here, as opposed to merely alluding to it, having fun with it — an homage. Again, we ask: Is a mere reference to a cultural phenomenon likely to make the average viewer think that phenomenon is the origin, sponsors, or “approver” of the referencer? Asked another way -- doesn't anybody have a sense of humor anymore? There was a time when this type of “homage” would have been appreciated by the referencee because it served to reinforce that person's pop culture stature. Yep. There was a time, my friend! S'gone.